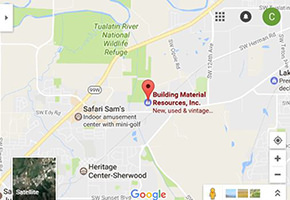 Check out our Web site for a virtual tour of our exiting facility and other Discounted Building Material! At BMR (Building Material Resources) be ready to $ave money and come in under budget on the material you want and need. $195 to $279 average cost for labor and materials on paint grade average size wood Barn doors with a simple design. The price is higher for larger sizes, wood species other than pine and the design you choose. Don’t let the low prices fool you, these are very nice quality doors built to hang on an exposed track inside the home application. *Choose the wood material from our huge warehouse in Pine, Douglas Fir, Beetle Kill Blue Stain Pine, Red or Alaska Yellow Cedar, Hemlock, Knotty Alder and even weather aged looking wood. Much of this is available in CVG or rustic looking material, YOUR choice! **Then choose the design and size and we can build it for you at a very affordable price. *** Pick out your exposed roller hardware kit starting at $98 (6 foot track single door) which includes everything you need except the handle and the door. This is high quality rolling door package Made in Oregon! We welcome you to visit our family owned business where our goal is to get you material you want and need for your current or future products at the lowest possible price. Our Cedar Decking and fencing prices and many of our inventory items bring buyers from 100’s of miles away on a daily basis. It is well worth the short journey to Sherwood to start saving substantial money on entry door in Craftsman and Shaker style, vinyl windows and patio sliders, The largest collection of interior and exterior doors you have ever soon, Deck screws and wood working / drywall screws, millwork in Primed MDF, veneered and solid wood options and all this at such very low prices. Olivia, Stefan, Daniel and our customer friendly crew look forward to satisfying all your Building Material and project needs.